“They pretend they are paying us, we pretend we are working,” went the old communist joke that accurately described the attitude towards the state-run economy and the dead end “careers” it provided. But while they lacked prestige and growth potential, they offered stable if meager compensation and security. Can this be the philosophy of Yahoo!’s army of “remote” workers and what has prompted the company to ban working from home? In a decade, Yahoo! went from a shining star and an innovator, to a company with a mirky vision with no clear path on how to get there. As a result, there was a period in the late 2000s, when BusinessWeek and The Wall Street Journal reported regularly on the Yahoo! talent exodus. It happened so often that it stopped being newsworthy. Executives came and went, strategies changed and as the board pretended to have found the latest path to recovery, the people that remained lost their sense of direction. Those of us, who have had the misfortune (or, if you are a half-glass full person, valuable learning experience) of toughing it out at a dead end job, know that how long you put up with it depends on various factors — from how experienced and good you are at what you do, to what stage of your life you are in. But no matter what the reason for staying is, if you think that you are making a compromise with yourself and your career, you inevitably start “pretending” to work. 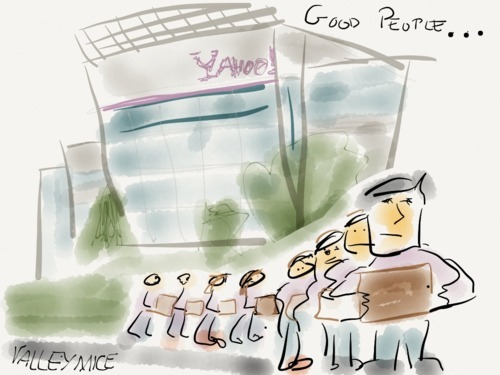 This might be the real reason for why Yahoo! wants everyone back on campus. It is hard to fire everyone and rehire the people that really want to be there. But by summoning them back, it hopes to weed out the true believers from the pretenders. As everyone from a former communist country will tell you – there is no better shake out than when we stop pretending we believe our own propaganda.